Easy read, not-very-difficult mystery, and a brief touch on inner character. 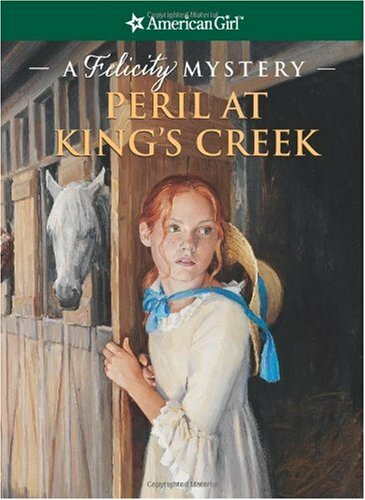 As Patriot-Loyalist tension grows, Felicity Merriman is looking forward to a summer spent at the family's summer home, King's Creek Plantation. She meets a friendly naturalist, but her father's apprentice, Ben, tells her to keep an eye on her new friend. Felicity has matured in this story. She is friendly and eager to learn; she also begins to teach her little sister Nan about horses. When the time comes for her to make some big decisions, she steps up to the plate. However, she still justifies her "freeing" her horse from the cruel Jiggy Nye (from "Meet Felicity") even though she admits that she knew disobeying her parents was wrong; her naturalist friend backs her up on that, though he has a point (to some extent) about dishonesty and loyalty. Felicity makes plans for a mission without even telling her mother anything; she makes her sister promise not to tell until a certain point. Felicity says that "Mother has taught us to be true as the Gospel, always." She tells Nan to "say a little prayer" for her. The Merrimans receive news about Patriot plantations being burned and sacked by Loyalist troops. Felicity fears this may happen to King’s Creek. A man is chased and bound. Until a certain point, there is no mystery at all. When the mystery does show its face, it’s one of character. Felicity learns that not all is as it seems and that loyalties may well conflict. Readers should be advised against taking drastic actions as Felicity did, namely, without authoritative help/consultation.